Great for costume, light painting photography, picture frames, larger jewellery or body decoration, RC hobby toys. Longer lengths of either wire will not damage wire or inverter but will be less bright. ARTISTS/DESIGNERS/COSTUME MAKERS note, EL and inverters will be discounted when you purchase both from us. 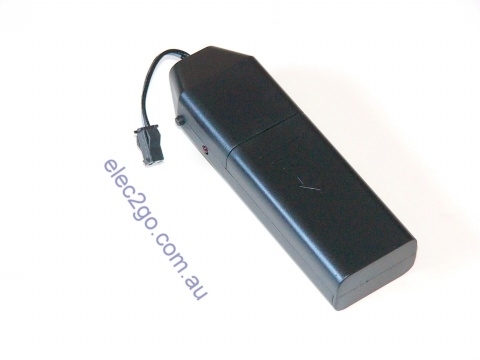 Contact info@elec2go.com.au for information. We have been using and selling this EL wire inverter for 10 years and rarely have a failure. When there has been a fail, it was due to someone inadvertently leaving the inverter powered on without the EL wire attached. This is a fantastic el wire inverter for costumes. 1 pair of AA batteries can light up 5m EL wire for 20 hours before you need to change the batteries. This inverter has a single port but you can add on more by purchasing splitters. If it is all a bit too much working it out, take a look at our EL wire kits - we have done the thinking for you.